Massive rectal bleeding is an uncommon presentation of ileal tuberculosis (TB). We report an uncommon cause of anemia in a post-renal transplant patient due to massive lower gastrointestinal (LGI) bleed. The index case had a normal upper and LGI endoscopy, but the 99technetium labeled red blood cell scan showed active bleeding from terminal ileum and caecum. Microscopic examination of the resected specimen revealed tubercular granuloma with acid-fast bacilli. Intestinal TB should be a differential diagnosis for massive LGI bleed in immunosuppressed patients in developing country. Tuberculosis (TB) is known as a grand masquerader. Its presentation is varied and is often difficult to diagnose. India accounts for the highest number of “reported” TB cases in the world, with an estimate of 1.7 million of the 10.4 million new cases in 2016. Yet, massive lower gastrointestinal (LGI) bleed from tubercular ulcers is a rare manifestation. In the present manuscript, we report a patient who developed one such complication, requiring extensive intervention. A 28-year-old man, who underwent live-related (Donor: father) renal transplant from outside hospital in 2015, on maintenance immunosuppression with tacrolimus, prednisolone and mycophenolate mofetil, presented with fever for 1.5 months, shortness of breath for 10 days, and hematochezia for a week. There was an associated rise in serum creatinine from a baseline of 1.3 to 11 mg/dl. A renal biopsy performed for allograft dysfunction was suggestive of polyomavirus infection. The patient was started on hemodialysis and referred to our unit for further management. The patient had a pulse rate, blood pressure and respiratory rate of 112/min, 100/60 mm of Hg, and 24/min, respectively. On examination, he had right-sided pleural effusion. Peripheral smear examination revealed microcytic hypochromic anemia with hemoglobin of 5.7 g/dl. Patient's general condition was stabilized with 3 units of packed red blood cell (RBC) transfusion. His HIV status was negative. Computed tomography angiography of the abdominal vessels, upper GI tract endoscopy, and the sigmoidoscopy were unremarkable. The pleural fluid revealed a total count of 400 cells/uL (90% polymorphs), protein of 1.5 g/dl, sugar 102 mg/dl (corresponding blood sugar 180 mg/dl), adenosine deaminase of 40.67 IU, and the gene Xpert was positive for Mycobacterium tuberculosis (MTB). The patient was subsequently started on anti-TB therapy and alternate day hemodialysis for anuria. After 3 days, patient developed hematochezia with subsequent shock. The patient was stabilized with fluids, and blood transfusion and an urgent upper GI endoscopy followed by sigmoidoscopy was performed, which were normal. A 99m technetium labeled RBC scan was done, which showed evidence of active GI bleed, likely site being the terminal ileum and caecum. 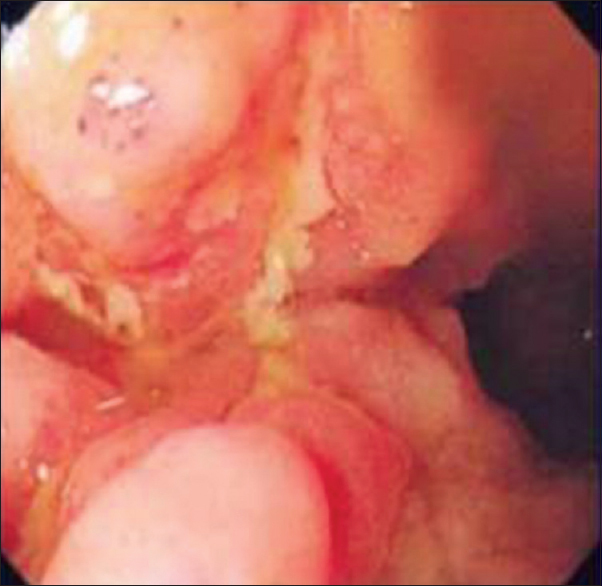 In view of life-threatening LGI bleed, emergency laparotomy along with intraoperative enteroscopy [Figure 1] was performed and showed multiple ulcers in terminal ileum, caecum, and proximal ascending colon along with multiple sessile polyps in the ileum [Figure 2]. Intraoperatively, there were multiple adhesions with thickened mesentery, and a mural thickening of 3 cm length at 2.5 feet proximal to ileocecal (IC) junction was observed. A right hemicolectomy followed by end ileostomy was performed. The biopsy unveiled necrotizing epithelioid cell granulomas with multinucleated giant cells cuffed by lymphocytes; stain for acid-fast bacilli (AFB) showed many AFBs (gene Xpert was positive for MTB) and a diagnosis of ulcero-constrictive TB of the intestine was made. During the hospital stay, the patient developed wound infection followed by wound gaping, swab culture, and sensitivity showed growth of Acinetobacter baumannii and was started on intravenous colistin in renal modified dose. However, his sepsis further worsened, and the patient succumbed to his illness. In the present study, we report a 28-year-old renal allograft recipient with intestinal TB presenting as massive LGI bleed. TB continues to be a rampant cause of significant morbidity and mortality in the developing/underdeveloped country, contributed by poverty, overcrowding, lack of knowledge, inadequate treatment and compliance, immunodeficiency virus infection and lack of adequate surveillance infrastructure contributing to its widespread infectivity. Abdominal TB is placed 6th in the order of frequency of occurrence of extrapulmonary TB in India. A retrospective study of abdominal TB in India, reported abdominal pain (69%), fever (44%), weight loss (44%), and abdominal distension (42%) as the common manifestation, while none had massive GI bleed on presentation or as a complication. The diagnosis of abdominal TB is delayed in most cases due to nonspecific findings. Intestinal TB presenting as massive LGI bleed is rare. One explanation postulated for this has been that even though there occurs increased capillary vascularity, concurrent obliterative endarteritis also occurs, making bleeding unusual. In the literature review, we found 10 cases of intestinal TB presenting with LGI bleed,,,,, seven had bleeding from the IC area (most common),,,,, two from the descending colon,, and one from the transverse colon. Barium enema was performed in seven of the 10 patients who reported with intestinal TB with massive rectal bleeding. Colonic lesions were revealed in five patients. The nature of the lesions remained unrecognized preoperatively. Colonoscopy was performed in four of the ten patients and showed lesions in two patients. Except for one patient, histological evidence of small intestinal TB was not found. In the index case, 99mTc RBC scintigraphy was useful to locate the bleeding lesion and to make a preoperative diagnosis of hemorrhage from the ileum. 99Tc RBC scintigraphy is more sensitive than angiography for detecting bleeding sites and can detect sites with a minimum-bleeding rate as low as 0.1 ml/min. As per existing literature, medical treatment with anti-tubercular treatment (ATT) is the preferred treatment of intestinal TB, except for patients with massive bleeding from the descending colon. Patients with massive bleeding due to intestinal TB are usually treated surgically with adjuvant ATT. In the present case, LGI bleed responded to surgery and diagnosis of GI TB was made on the basis of histopathological examination of the resected specimen. Another factor compounding the predisposition to TB is post transplant immunosuppressed state, as in our case. In post-solid organ transplant patients, multiple immunosuppressive drugs increase the risk of extrapulmonary TB, while in the present case, the additional effect of uremia probably modified the behavior of TB resulting in mortality. In conclusion, we describe a rare presentation of GI TB presenting with massive LGI bleed in post renal transplant. GI bleed is a rare but life-threatening complication of intestinal TB, and thus having a high index of suspicion in vulnerable patients is needed for early diagnosis and initiation of ATT. WHO | Global Tuberculosis Report 2016. World Health Organization; 2017. Menon PR, Nambiar S, Thunga G, Patidar V, Khera K, Vohra Y. Clinical presentation of abdominal tuberculosis in Indian scenario: A retrospective study. Res J Pharm Biol Chem Sci 2015;6:44-50. Basiri A, Hosseini-Moghaddam SM, Simforoosh N, Einollahi B, Hosseini M, Foirouzan A, et al. The risk factors and laboratory diagnostics for post renal transplant tuberculosis: A case-control, country-wide study on definitive cases. Transpl Infect Dis 2008;10:231-5. Sherman HI, Johnson R, Brock T. Massive gastrointestinal bleeding from tuberculosis of the small intestine. Am J Gastroenterol 1978;70:314-6. Verma P, Kapur BM. Massive rectal bleeding due to intestinal tuberculosis. Am J Gastroenterol 1979;71:217-9. Rabkin DG, Caiati JM, Allendorf JA, Treat M. Intractable hematochezia: An unusual presentation of intestinal tuberculosis. Surgery 2003;133:592-3. Pozniak AL, Dalton-Clark HJ, Ralphs DN. 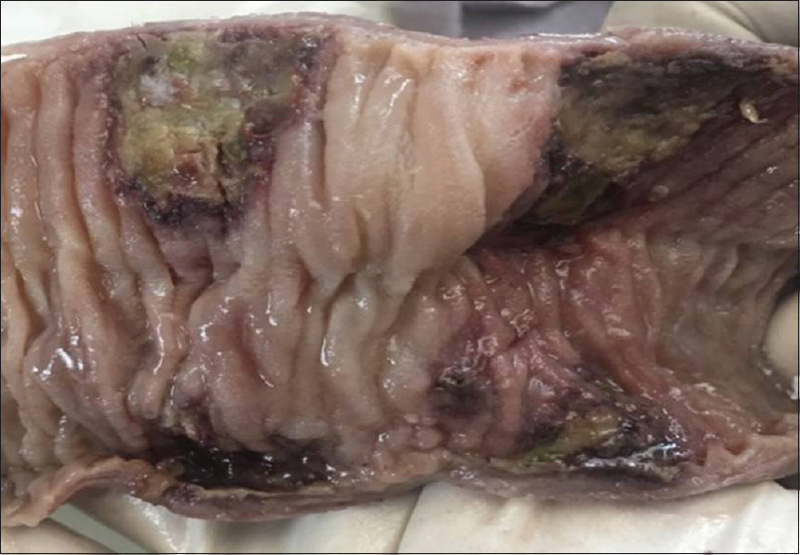 Colonic tuberculosis presenting with massive rectal bleeding. Tubercle 1985;66:295-9. Hiran S, Pande TK, Kumar S, Rao VV, Shah H, Pani S, et al. Massive rectal bleeding due to ileocaecal tuberculosis (conservative approach) Postgrad Med J 1994;70:55-6. Brenner SM, Annes G, Parker JG. Tuberculous colitis simulating nonspecific granulomatous disease of the colon. Am J Dig Dis 1970;15:85-92. Monkemuller KE, Lewis JB Jr. Massive rectal bleeding from colonic tuberculosis. Am J Gastroenterol 1996;91:1439-41. Devanesan JD, Sable RA, Pitchumoni CS, Lev R, Zapiach L. Segmental tuberculosis of the colon mimicking carcinoma. Arch Surg 1980;115:90-1. Tishler JM. Tuberculosis of the transverse colon. AJR Am J Roentgenol 1979;133:229-32. Smith R, Copely DJ, Bolen FH. 99mTc RBC scintigraphy: Correlation of gastrointestinal bleeding rates with scintigraphic findings. AJR Am J Roentgenol 1987;148:869-74. Debi U, Ravisankar V, Prasad KK, Sinha SK, Sharma AK. Abdominal tuberculosis of the gastrointestinal tract: Revisited. World J Gastroenterol 2014;20:14831-40. Abdelrahman M, Sinha AK, Karkar A. Tuberculosis in end-stage renal disease patients on hemodialysis. Hemodial Int 2006;10:360-4.